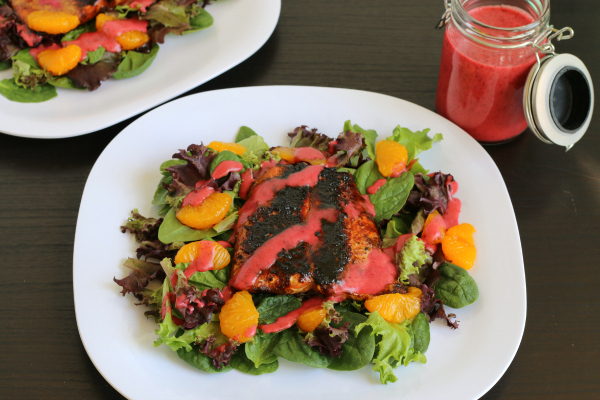 Fresh, not farmed, salmon is grilled until perfectly blackened for this blackened salmon salad. Such a yummy summer salad! Today’s recipe was inspired by an amazing salad that I had during our anniversary getaway last year. The marinated salmon was perfectly cooked and served on fresh spring greens and spinach and had mandarin oranges in it. It was so tasty that I craved it the rest of our trip! I was given the opportunity to work with Alaska Seafood to highlight the nutrition and health benefits of eating Alaska seafood and develop a gluten-free recipe with it. 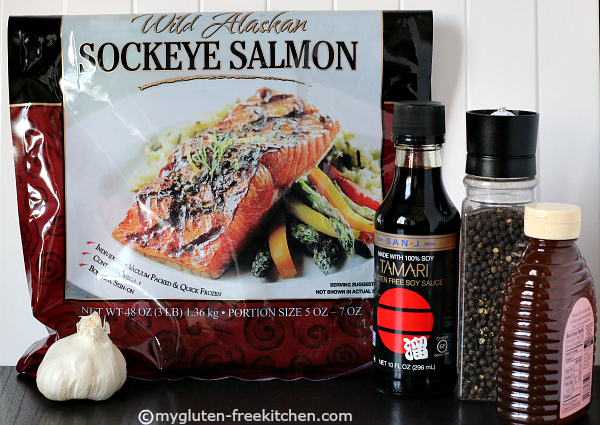 I chose Sockeye Salmon, bought frozen at my local store, as salmon is a favorite of my family. I wanted to create an easy weeknight meal that would be enjoyed by my whole family. I thought of a number of different recipes, but kept thinking about that amazing salad I’d had and decide to try to recreate it. I sure got close with this recipe! Did you know that Alaska supplies nearly 60% of the nation’s seafood and about 90% of North America’s salmon? I have quite a few friends that live in Alaska and work on the fishing boats. I’m so envious of their fresh fish! I am thankful that I can find frozen Alaska Seafood at my local stores though. You can have this meal completely cooked, plated, and on the table in about 45 minutes! That’s perfect for a busy weeknight dinner. Plus, it is a meal you can feel good about feeding your family! The salmon is high in protein, low in saturated fat, and one of the best sources of heart-healthy omega-3 fatty acids. The spring salad, spinach and mandarin orange slices make this salad high in iron, Vitamin A, and Vitamin C.
Also, you can grill the salmon instead of cooking in a skillet on the stove top. I just don’t know how to operate our barbeque still! I know – crazy! I singed my eyebrows when I was trying to operate our gas grill when I was a teenager, so now I just stay far away from those things! Next time I make this though, I’ll be sure to have hubby grill the salmon since then I’ll have even less clean-up. I chose to make a homemade vinaigrette using wild huckleberries, since I had a huge bag of them in my freezer. Huckleberries grow in the mountains not too far away from where I live here in Idaho and are such a treat! I realize not many people have those on hand, so feel free to use blueberries, raspberries or blackberries in place. 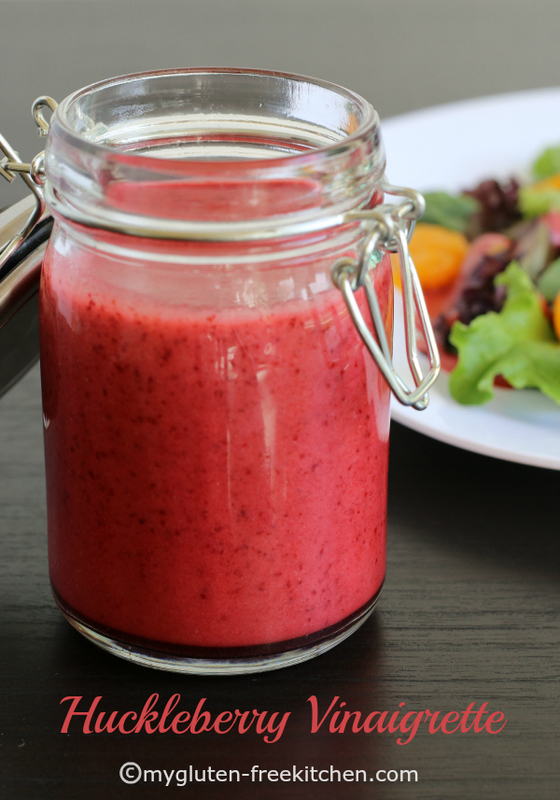 The berries add great flavor to this light dressing. I didn’t make it too sweet, given that there is some honey in the salmon and the mandarin oranges already add some sweetness to the recipe, but you can sure add additional honey to the vinaigrette if you’d like. After you try this salmon salad, your next new recipe to try should be this Shrimp Avocado Salad using fresh shrimp! It’s on my must make soon list! So is this Chicken Greek Salad recipe that has olives and avocados! I hope you enjoy the salad! I’d love to hear what your favorite seafood is and how you like to prepare it. In a small bowl, whisk together marinade ingredients: honey, gluten-free soy sauce, garlic, and pepper. To a resealable gallon-size ziploc bag, add salmon fillets and marinade. Seal and store in refrigerator while you make the dressing. Place all vinaigrette ingredients in blender (olive oil, apple cider vinegar, sea salt, frozen huckleberries, water, honey), cover, and blend for about 30 seconds. (Note: on my Blendtec, there is a "dressings" button, so that's what I used.) Pour into a small pitcher or jar for serving. Divide spring lettuce mix, spinach, and mandarin oranges among 4 plates. In a large skillet, heat the 2 tablespoons olive oil over medium heat. Remove salmon fillets from refrigerator. Add salmon fillets, skin side down. Discard freezer bag with remaining marinade. Cook 3-4 minutes or until skin side is dark but not burnt. Flip salmon fillets over. While other side is cooking, you can gently use a fork or knife to help peel the skin off cooked side and discard. Cook for 3-4 minutes. Test for doneness (salmon should flake apart when done). Divide cooked salmon among plates of salad. Pour on desired amount of huckleberry vinaigrette and serve! I use San-J Tamari gluten-free soy sauce. Guess what I have in my freezer?! Salmon AND frozen huckleberries! Are you impressed? I love blackened salmon. Love healthy dinners like these! What an Amazing looking salad! Love the vinaigrette!! This sounds lovely! 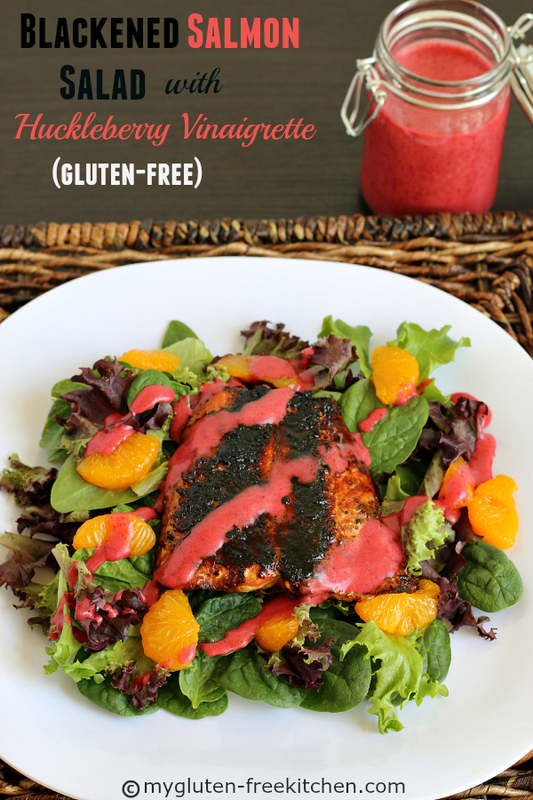 The huckleberry is so perfect for salmon! So unique! Mmmm – I’ve been craving salmon and salad like crazy recently (I know, who does that?!) and this looks like it will hit the spot perfectly! Michelle, your fish looks delicious! I live in Mississippi and blackened fish is really popular here, especially on the Gulf Coast. I’m pinning this! This salad looks so fresh & healthy, Michelle. Can’t wait to try it! I buy those same salmon filets and they have gotten me through many many “I don’t know what the heck to make for dinner” moments. So yummy. I’m always looking for new ideas for salmon, and this looks AWESOME! Oh that dressing looks phenomenal – I love the color!! I don’t think I’ve ever had the pleasure of trying a huckleberry, but now I’m intrigued. Such a beautiful, healthful meal! I have been going seafood crazy lately, and this salad looks perfect! LOVE that dressing, too! I love this salad so much! That vinaigrette is so darn pretty! We made this tonight to test out for an upcoming wedding dinner, and it was totally a hit!! However, our teeth turned blue/purple from the delicious fresh vinaigrette, did that happen to anyone else? I am thinking I might try a huckleberry recipe from huckleberry vinegar instead?